Fish and Wildlife Unit, Department of Veterinary Public Health and Preventive Medicine, University of Ibadan, Ibadan, Nigeria. The Niger Delta is located in Southern Nigeria and is Africa’s largest delta, covering about 70,000 square kilometers, and with about onethird of it made up of wetlands, and the third largest world mangrove forests. The Niger Delta is unique in Nigeria because it is the home of Nigeria’s oil industry. Exposure to oil or its constituent chemicals can alter the ecology of aquatic habitats and the physiology of marine organisms (Chindah et al, 2004). When oil pollution gets in water, some of its components are degraded and dispersed by evaporation, photochemical reactions, or bacterial degradation, while others are more resistant and may persist for many years, especially in shallow waters with muddy sediments (Mucha et al, 2003). Polycyclic aromatic hydrocarbons exist naturally in the environment, but at considerably low levels, they become potentially dangerous when detected in high quantity due to anthropogenic activities (Wills, 2000, Koller, et al., 2004). They are considered to be hazardous because they have carcinogenic and mutagenic properties, and are stable in the environment (Guinan et. al, 2001). A major source of PAHs in the environment is fossil fuel combustion processes, crude oil, coal and oil shale (Mastal and Callen, 2000). It is therefore of paramount importance that a constant assessment assessment of susceptible water bodies be carried out to monitor the level of polycyclic aromatic hydrocarbons considering the potential impact of PAHs on aquatic ecosystem and public health. 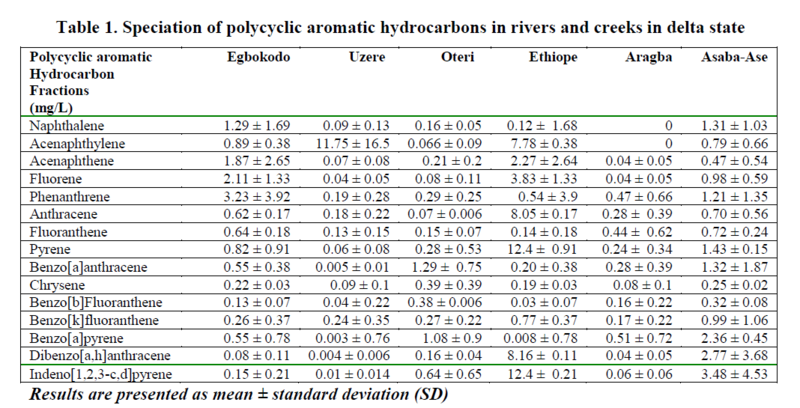 This study was therefore designed, to screen for polycyclic aromatic hydrocarbons in selected Rivers in oil producing communities in Delta state, Nigeria. The bioconcentration levels of PAHs in fishes sourced from these Rivers were also determined. Six water bodies were selected in Delta state as follows: Egbokodo River in Warri, River Ethiope in Sapele, Urie River in Igbide Isoko, Asaba- Ase creek, Aragba River in Abraka, and Uzere Creek. The choice of sample locations was influenced by their distance from industrial locations. Three of the six rivers (Egbokodo River in Warri, Uzere Creek and Urie River in Igbide Isoko) are situated in locations with known oil exploratory activities. The other three locations (River Ethiope, Asaba-Ase creek and Aragba River) had other on-going human activities (Sawmill, domestic and university respectively). Some of the sample points are presented beneath as Figure 1. 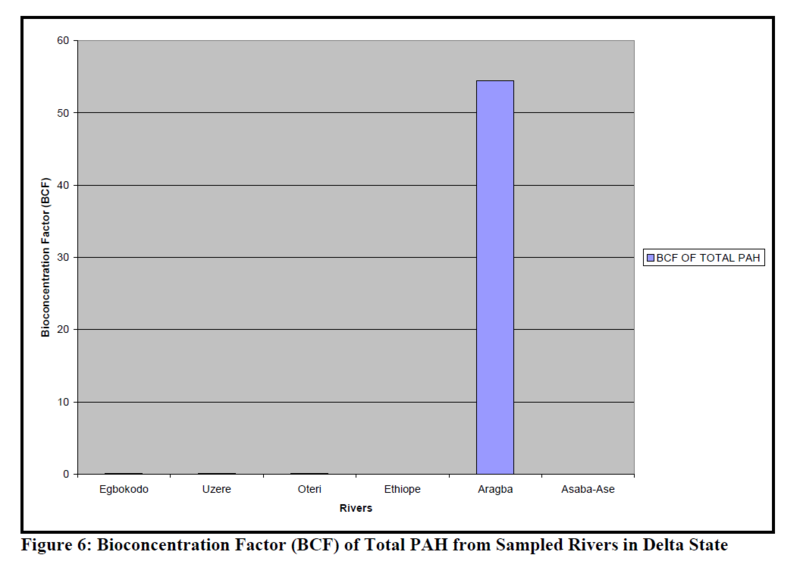 Sampling was conducted on six Rivers and creeks within Delta state in February, 2009. Up-stream and downstream water samples were col-lected from each water body. Water samples were collected at a 30cm depth in pre-cleaned 500 ml plastic bottles and accurately labeled. Available live fish samples of different species were purchased from the local fishermen at each sampling site, the samples were immediately cleaned of particulate debris and packed in la-beled clean plastic bags and immediately pre-served in coolers containing ice packs. All sam-ples were kept on ice during transportation to the laboratory for analysis. Some of the fish samples were processed into dry ready-to-eat samples by smoke-drying over coal heat before being ana-lysed. The molecules of polycyclic aromatic hydro-carbons (PAHs) are soluble in organic solvents. Prolonged boiling of the mixture of solvent and extracted product can lead to under-estimation of the contents of residues. Because of this degra-dation the most commonly used method of extraction is cold solvent extraction by micro meth-ods (Steinwandter, 1992). Conventional liquid-solid extraction in the form of shake flask extrac-tion was carried out by placing about 5g weighed fish sample in a mortar and homogenizing it with equivalent weight of anhydrous sodium sulfate. The homogenized fish sample was placed in a stoppered brown glass bottle and was dissolved with 25 mL acetone/benzene mixture (50:50 by volume). Extraction was done by shaking the bottle vigorously in a back and forth motion for 30 minutes. Samples were extracted twice. The solvent was separated from the matrix by filtra-tion through anhydrous sodium sulfate. The ex-tracts were combined, dried in anhydrous sodium sulfate and the volume reduced to 1 ml by rotary evaporation after which there was solvent ex-change to iso-octane. The extract was thereafter carefully decanted and sieved into pre-weighed bijou bottles and allowed to evaporate for 48 hours. The weight of the dry fat sediment was taken before a process of fat separation was done by passing the fat sediment washed with peptone through layers of glass wool, 3 gms of silica gel and 1 gm of anhydrous sodium sulphate respec-tively. The solvent was again left to evaporate and the sediment rinsed out using iso-octane into vials, before being determined with a Gas Chro-matograph (GC, HP4890, Hewlett Packard, Avondale, PA, USA). Injector and detector tem-peratures were both 300oC. The column was held at 508C for 1 min, ramped at 25oC/min to 120oC and 3oC/min to 320oC, and held for 17 min at 320oC. Helium was used as the carrier gas, with a flow rate of 0.6 ml/min at 50oC. The calculation method and quality assurance are according to Baussant et al. (2001). All chemicals used were of analytical grade and obtained from Sigma-Al-drich Co. (St. Louis, MO, USA). Data collected were computed into means with standard deviation. Means were compared statistically using students’ “t-test” and ANOVA. Results were adjudged significant at 95% confi-dence limit. Most of the Rivers were turbid and dirty (Figure 2); with on-going fishing activities. The results of total PAH In sampled water, fresh fish and dry ready-to-eat fish are presented as Figures 3, 4 and 5. Total PAH level in rivers was significantly higher (p=0.0006) in Ethiope River, while, PAH level in fresh fish and dry ready-to-eat fish from all sampled rivers was not significantly (p=0.47 and 0.42, respectively) different from one another at 95% confidence limit. The results of the quantitative analysis of the 16 priority PAHs (naphthalene, acenaphthylene, acenaphthene, fluorene, phenanthrene, anthra-cene, fluoranthene, pyrene, benzo[a]anthracene, chrysene, benzo[b]fluoranthene, benzo[k]fluoranthene, benzo[a]pyrene, dibenzo[a,h]anthracene, benzo[g,h,i]perylene and indeno[1,2,3,cd]pyrene) in water, fresh and ready-to-eat fish is presented in Tables 2, 3 and 4 respectively. The BCF of total PAH in the different Rivers is presented as Figure 6, while BCF of the differ-ent fractions of PAH in the sampled Rivers is given in Table 4. The ANOVA showed that the differences in the BCF of the different fractions in the Rivers was not significantly different (p=0.42). The PAHs form one of the most important classes of persistent pollutants. A major source of PAHs in the environment is from fossil fuel combustion processes, crude oil, coal and oil shale (Mastral and Callen, 2000). PAH was de-tected in all the rivers sampled, even those in communities where there are no oil exploratory activities. This maybe adduced to the intercon-nectivity of the water bodies. However, the levels in water were below 10mg/L being the maximum recommended total hydrocarbon limit by the Ni-gerian Federal Ministry of Environment (FMENV, 1992). Although, total PAH level was highest in Ethiope, which is the only River that takes its source solely from the Atlantic ocean; others either share source with the River Niger or just drain into the Niger. Uptake rates and bioaccumulation levels of substances within the body tissues are of partic-ular interest because they can be related to tox-icity. Consequently, the relationships between toxicity and body burden can be used to predict impact (Chapman, 1997). Of the PAHs detected in all the water bodies, benz[a]anthracene and benzo[a]pyrene, with known record of toxicity were found to be highest in Oteri and Asaba Ase Rivers. 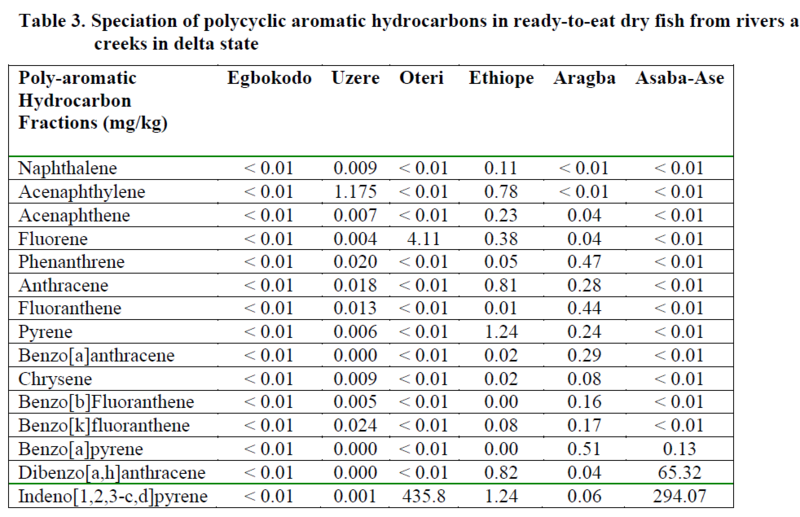 Both indeno[1,2,3-c,d] pyrene and pyrene had the highest values of 12.4 ppm in the Ethiope river. 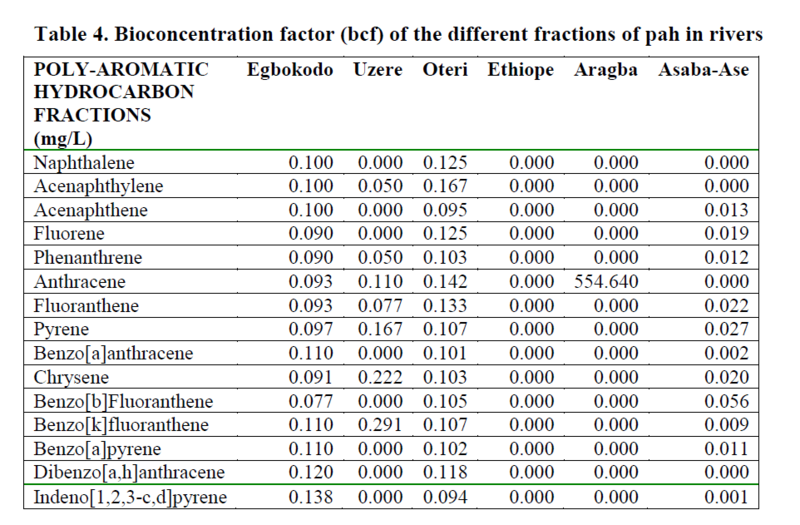 The value of acenaphthylene was highest (11.75 ppm) in Uzere River. 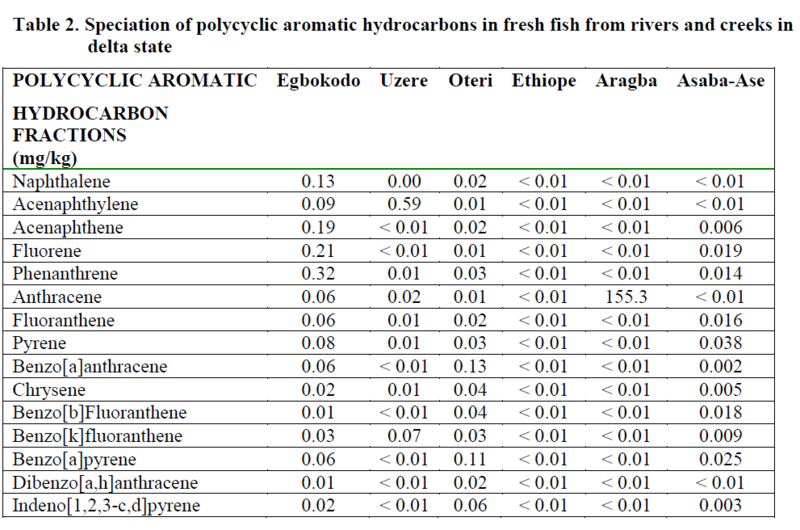 In the fresh fish samples, the fish from Aragba River had the highest value of 155.3 ppm of anthracene, while samples from Uzere River contained 0.59 ppm of ancenaptylene. This was no surprise since all the fish from Aragba River was the biggest and pos-sibly the oldest. Fish samples from other loca-tions were reasonably small and obviously im-mature. The ability of fish to metabolize PAHs may explain why benzo[a]pyrene was found only low levels in fish from Oteri and Asaba-Ase, which were the most contaminated with benzo[a]pyrene (Varanasi and Gmur, 1981). Consequently, future risk assessment studies should perhaps consider the fate and effects of the PAH metabolites to aquatic biota in which metabolization is an important excretion path-way. 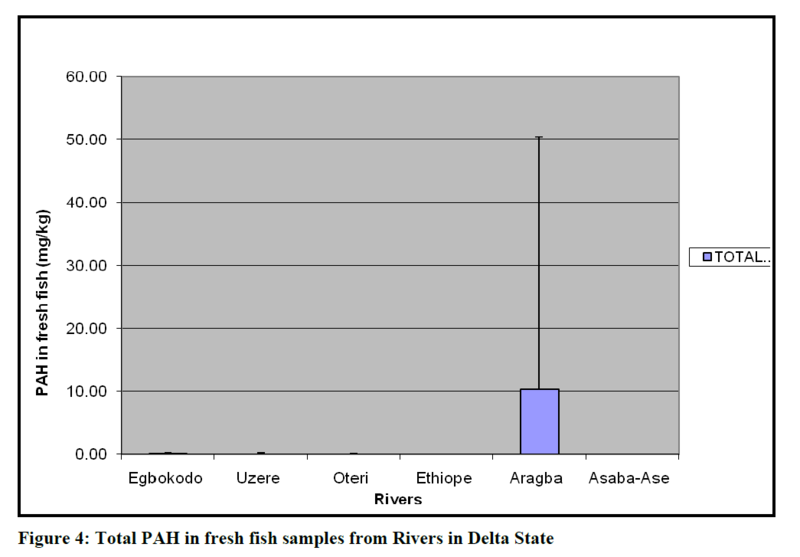 Dry fish samples obtained from Oteri had the highest level of indeno[1,2,3-c,d]pyrene (435.8ppm) followed by Asaba-Ase river (294.07 ppm). Generally, indeno[1,2,3-c,d]pyrene was the highest PAHs in the dry fish samples. It was pre-sent in almost all the dry samples, except for Eg-bokodo and Uzere River, where it was detected only at the level of ppb. The value recorded in this study is much higher than the recommended tolerance levels of 0.01mg/g for total hydrocar-bon in fish (Jack et al., 2005). Total bioconcen-tration factors (BCF) ranged from 0.0-1.73 in the rivers, except for Aragba, which had a very high BCF (554.6) for anthracene. Several studies have reported BCFs in fish for benzo[a]pyrene (Freitag et al., 1985, Cohen et al., 1994). The recom-mended BCF value of benzo[a]pyrene for whole fish is 583. In this study, BCF for benzo[a]pyrene was between 0-0.11. More insight into the dis-solution rates of PAHs from dispersed oil drop-lets is required in order to more accurately pre-dict bioaccumulation in aquatic biota. The low bioconcentration factor is in disagreement with what was expected from the partition coefficients of the larger PAHs (Baussant et al., 2001). Yet the potential environmental impact recognized for these larger PAHs should not be disregarded in environmental risk assessment because they can be metabolized apparently quickly to sub-stances with mutagenic and carcinogenic poten-tial for the exposed organisms. The International Agency for Research on Cancer (IARC) has determined that benz[a]anthracene, benzo[a]pyrene, benzo[b]fluoranthene, benzo[j]-fluoranthene, benzo[k]fluoranthene, and indeno-[1,2,3-c,d]pyrene are possibly carcinogenic to humans (IARC, 2011). The US Department of Health and Human Services (DHHS) has determined that benz[a]anthracene, benzo[b]-fluoranthene, benzo[j]fluoranthene, benzo[k]-fluoranthene, benzo[a]pyrene, dibenz[a,h]-anthracene, and indeno[1,2,3-c,d]pyrene are known animal carcinogens (US DHHS, 2011). Smoking of fish samples did not significantly increase the level of PAH in comparison to the fresh samples, probably because all fish samples were skinned before digestion. 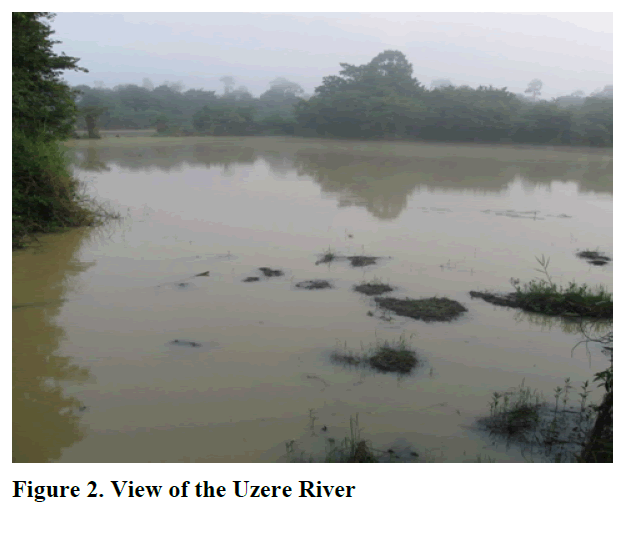 This report on the concentration of polycyclic aromatic hydrocarbon in the surface water and fish from aquatic system in Niger Delta should contribute to the baseline for monitoring of the water for pollution from oil exploratory activities. Chindah, A.C., Braide, S.A., Sibeudu, O.C., (2004). Distribution of hydrocarbons and heavy metals in sediment and a crustacean (shrimps-Penaeus notialis) from the Bonny/New Calabar River Estuary, Niger Delta., AJEAM-RAGEE, 9: 1 –17. Cohen, Y., Winer, A.M., Creelman, L., Stein, E., Kwan, A., Chu, J., (1994). Development of intermedia transfer factors for toxic air pol-lutants. California Air Resources Board, Contract No. A032-170, I-VII. FMENV Federal Ministry of Environment, (1992). Environmental Impact Assessment Decree 86, 1992 (Procedural Guidelines). – Published by the Federal Government Press, Lagos, Nigeria. International Agency for Research on Cancer (IARC) (2011). Agents Classified by the IARC Monographs, Volumes 1–100. 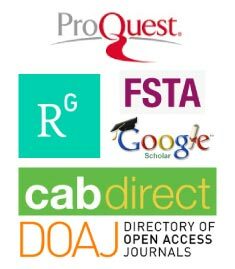 http://monographs.iarc.fr/ENG/Classification/ClassificationsGroupOrder.pdf (Accessed June 15, 2011). Jack, I.R., Fekarurhobo, G.K., Igwe, F.U., Okorosaye-Orubite, K., (2005). Determina-tion of total hydrocarbons levels in some marine organisms from some towns within the Rivers State of Nigeria. Journal of Envi-ronmental Science and Management, 9(3): 59-61. Koller, K., Brown, T., Spurgeon, A., Levy, L., (2004). Recent development in low level ex-posure and intellectual impairment in chil-dren, Environmental Health Perspective, 112(9): 987-994. Mastral, A.M., Callen, M.S., (2000). A review on polycyclic aromatic hydrocarbon (PAH) emissions from energy generation. Environ-mental Science and Technology, 34(15): 3051-3057. Steinwandter, H., (1992). Contributions to the ethyl acetate application in residue analysis. Fresenius' Journal of Analytical Chemistry, 343(7): 604-606. US Department of Health and Human Services (2011). Public Health Service, National Toxicology Program. Report on Carcino-gens, Twelfth Edition. http://ntp.niehs.nih.gov/ntp/roc/twelfth/roc12.pdf (Accessed June 14, 2011). Varanasi, U., Gmur, D.J., (1981). In vivo metab-olism of naphthalene and benzo[a]pyrene of flatfish. In: Cooke M, Dennis AJ, eds. Chemical analysis and biological fate: Poly-nuclear aromatic hydrocarbons. Fifth Inter-national Symposium. Columbus, OH: Bat-telle Press, 367-376. Wills, J., (2000). 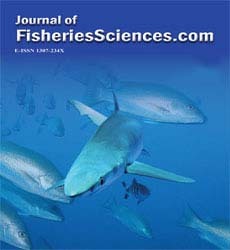 A survey of offshore oil field drilling wastes and disposal techniques to reduce the ecological impact of sea dump-ing. Sakhalin Environmental Watch, 13: 23-29.